Last week was the second week of the AZWatergate Corruption trial and the tentacles of scandal have reached Governor Doug Ducey, Chamber of Commerce CEO Glenn Hamer, and APS. Why does this matter? It’s beginning to reveal a dark web of connections between power-hungry politicians who are striving to control Arizona–all the way up to the governor’s office. Make no mistake: the players at the heart of this scandal are in the upper echelon of the state’s political world, and particularly the state’s Republican party. 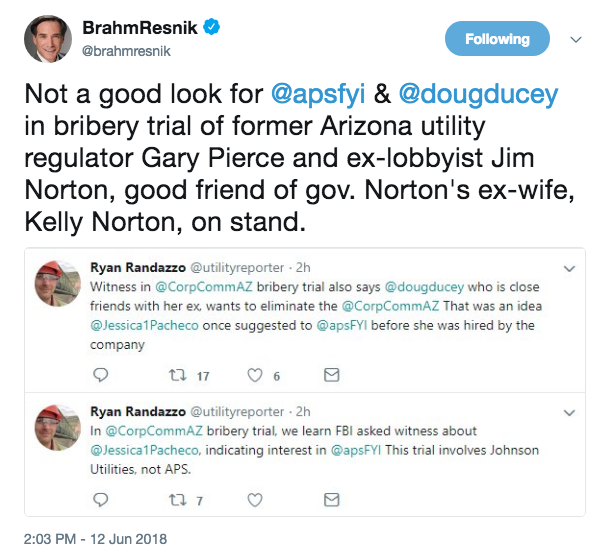 Governor Ducey’s college friend and the state’s top lobbyist, Jim Norton, is on trial for a bribery and corruption scheme. Norton has lobbied for huge corporate interests like APS and the Arizona Chamber of Commerce, Ducey’s main political allies. Norton is a major campaign donor, having given at least $73,000 to Republican candidates, including Governor Doug Ducey. Norton-led and aligned groups flooded Doug Ducey’s 2014 election (and now re-election) for governor with dark money contributions; Ducey won his election with the support of these anonymous corporate donors and then immediately got to work in support of Jim Norton’s big-money clients, like APS, the Arizona Chamber, and the Koch Brothers. Behind closed doors Jim Norton, Ducey, APS and the AZ Chamber have set the state’s political agenda for the last four years. Now, one of them has been allegedly caught bribing elected officials in support of corporate profits. 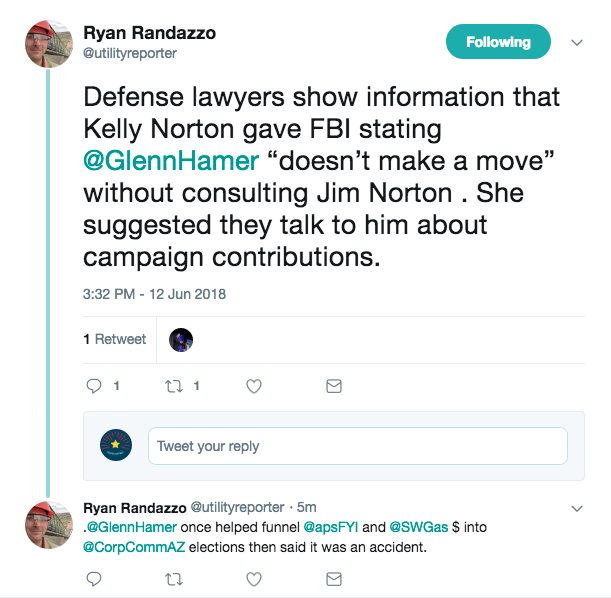 Jim Norton lobbied for, and was on the Board of Directors of, the Arizona Chamber of Commerce and Industry which is widely acknowledged to be driving Ducey’s political agenda at the Arizona legislature, including cutting corporate taxes, challenging the state’s new minimum wage law, attacking unions and renewable energy, and making it more difficult for citizens to engage in direct democracy through voter-led ballot initiatives. APS has a well-documented history of controlling politics at the state capitol and this year they’ve launched a full-on blitz against the Clean Energy for Healthy Families Campaign. This trial is just getting started and undoubtedly more corruption is going to come to light. Prosecutors allege the defendants attempted to have George Johnson buy a $350,000 property for a used car lot for the Pierces, but the deal fell through. Oh No, Not Your Second Home! The Nortons were involved in lobbying, governmental relations and other political activities on behalf of various companies belonging to George Johnson, and that Kelly Norton will now serve as the “premier witness” against her ex-husband regarding some of those activities alleged to have been illegal. 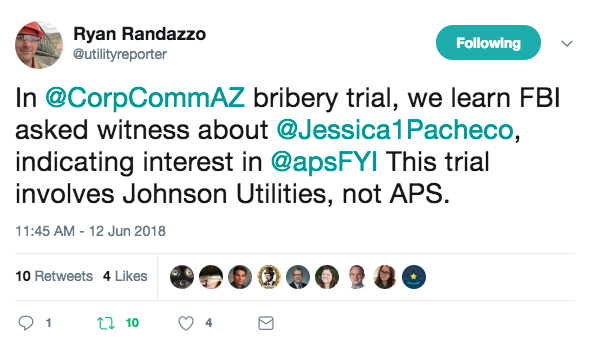 The hearings in San Tan Valley, and our #AZWatergate launch, were covered by a wide variety of media outlets - check out this great story on ABC 15. More than 10,000 people watched the press conference on Facebook, and another 10,000 have seen our AZ Watergate video. We learned that Governor Ducey, who took thousands in campaign donations from the men at the center of the #AZWatergate scandal, had quietly given that money to the Salvation Army in October, after an initial outcry over the summer. Our pressure forced him to go public with his decision. Local residents have been pointing out for years that there are problems with undrinkable water and inadequate service in Pinal County. In response to the massive outpouring of complaints at the public hearings, the Arizona Corporation has opened an emergency investigation into concerns about clean water and deeply inadequate service in Pinal County. If you weren't able to speak at the hearing, but have concerns about Johnson Utilities, you can submit a complaint on the docket. Click here for instructions. Make sure you're following San Tan Valley Clean Water Advocates on Facebook - they're the ones leading the charge in San Tan Valley.